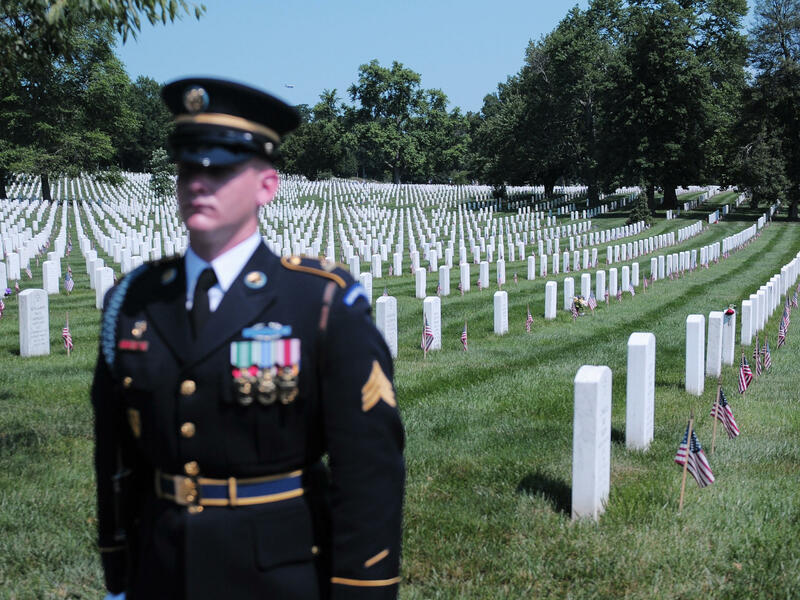 A U.S. Army honor guard stands at attention during a ceremony to mark Memorial Day, this week at Arlington National Cemetery. In The Last Full Measure: How Soldiers Die In Battle, Michael Stephenson describes how soldiers fight and die, how those who have lived deal with the experience of combat, and what it reveals about warfare and human nature. He acknowledges it's a sensitive subject, but he argues it's an important one. Understanding how soldiers die, Stephenson tells NPR's Neal Conan, "is central to an understanding of what combat is. And I think we have to engage with it." Stephenson talks with Conan about the long history of soldier deaths in combat and the social, political and technological factors that have contributed to the changing nature of combat. "Those elements are in some way important to understand because they enable men and societies to commit themselves to battle and being killed. And so the heroic tradition, which in Western society goes back to the ancient Greeks, is a sustaining one. And it's no good just throwing that out. We need that. "... I think that we need these narratives. We need these stories. And they go on throughout history about how we can deal with the fact that if we are, for example, competent, that we might be killed for perhaps a cause that we don't particularly understand. But we are sustained, I think, by something much greater, which is an idea that there is a meaning to our death. Well, hopefully for soldiers there is. "But there has to be some kind of apparatus, intellectual and psychological, to sustain soldiers to go through what they have to go through." "The history of warfare ... to generalize, is about the distance between the combatants. In ancient warfare the distance between the combatants was very close. And as missile warfare — i.e., that is, you know, arrows or guns — became more sophisticated, the distance is lengthened. "And then ... around about the Second World War ... you had something called 'the empty battlefield' ... That is, that you are killed by somebody you never, ever see. You are killed [by] a mortar bomb. You are killed by a sniper. In our most recent wars, America's most recent wars in Iraq and Afghanistan ... most of the American deaths ... are caused by either improvised bombs, roadside bombs or by snipers. I mean, these men very rarely, very rarely have personal contact with their enemy. "And there's a sense of frustration about that, that one can trace back in history. And it psychologically is very, very difficult for these men to deal with. They don't have any satisfaction about coming to grips with something that they can, you know, they can fight, they can see. They see ... their comrades killed by anonymous weapons. And this is very, very difficult." "My feeling is that soldiers need to be sustained by some sense of what they're doing and the risks that they're taking is worth it. And ... in our most recent wars — I'd say from Vietnam onwards — there's an ideological problem ... where big chunks of society don't really support the wars. And therefore the soldiers sometimes feel very isolated. "And then there's the nature of the warfare, which ... is so disassociated. And how do you create a heroic context for the fighting? And what these soldiers do — my understanding is — is that they create the heroic context within their units. And they, in a way, try and isolate themselves from what maybe the rest of society — or some part of that society that doesn't agree with this war — feels. "So they just dig in, and they create their own value system. And it might not be one that the rest of us like very much. I mean, urinating on the bodies of dead soldiers maybe would repel most of us. And I'm sure it is repellent. But I think that they have rituals that support their group cohesion. And that's very important for them ... to be able to carry on doing the work that they have to do, whether we agree with it or not. But it's the work that they are told to do." This is TALK OF THE NATION. I'm Neal Conan in Washington. For those of us who've never been in uniform, discussions of war and combat can often take the form of a partisan debate about the politics of who and why we're fighting, about whether we should be doing so in the first place. In a new book entitled "The Last Full Measure," Michael Stephenson reminds us that those who find themselves in combat face entirely different questions. War is about many things, he writes, but at its core it's about killing or getting killed. He traces the experience of death in combat from prehistory to the present, tracking the social, technological and political forces that change the nature of battle. And Stephenson offers a larger narrative about human nature and the brutal reality of battlefields from tribal raids to industrialized slaughter. If you've been in combat, what don't the rest of us understand? Our phone number, 800-989-8255, email us: talk@npr.org. You can also join the conversation on our website. That's at npr.org. Click on TALK OF THE NATION. Later in the program, a rare visit to al-Qaida controlled cities in Yemen. But first, Michael Stephenson joins us from our bureau in New York. His new book is "The Last Full Measure: How Soldiers Die in Battle." And nice to have you on TALK OF THE NATION today. CONAN: And you begin your book by quoting the military historian Victor Davis Hanson. Military history, he said, must never stray from the tragic story of killing. And I wonder, was it difficult to focus on that issue? STEPHENSON: Well, you know, it's a - it is a problem in a sense that you are dealing with something that is very awful. But it's central to an understanding of what combat is. And I think we have to engage with it, and I wanted to engage with it. CONAN: And dispense with the glorification and the romanticization that so often accompanies it. STEPHENSON: Well, I think that it's a complicated thing. I mean, those elements are in some way important to understand because they enable men and societies to commit themselves to battle and being killed. And so the heroic tradition, which in Western society goes back to the ancient Greeks, is a sustaining one. And it's no good just throwing that out. We need that. CONAN: You, for example, cite, well, going right to the source - Homer, "The Iliad," you say is part of an essential process to burnish combat killing and present it in a heroic form. We've had to be taught how to love war because seen unadorned, it is too despicable to bear. STEPHENSON: Yes. I think that we need these narratives. We need these stories. And they go on throughout history about how we can deal with the fact that if we are, for example, competent, that we might be killed for perhaps a cause that we don't particularly understand. But we are sustained, I think, by something much greater, which is an idea that there is a meaning to our death. Well, hopefully for soldiers there is. But there has to be some kind of apparatus, intellectual and psychological, to sustain soldiers to go through what they have to go through. CONAN: And going back to the siege of Troy, it is interesting - you note the discrepancy between the way we read the descriptions in Homer, which are individualized battles between named opponent, and what must have happened actually on the battlefield where - well, you're wearing one of those helmets, you can't see anything. STEPHENSON: Yes. I think it's interesting. I think there are two things going on in that ancient tradition which carry on throughout history. One is that you have the idea of the individual and named combatant, somebody who is graced by his name. And if he's killed he will be known. And then you have the mass who are not, who are anonymous. And that contradiction, that tension between the named and the anonymous is part of our whole tradition of the heroic and the antiheroic. CONAN: And there is also a tension that describes a great deal of the arc of your book between the noble warrior who faces his opponent at sword's length and the rather more sneaky character who fires the arrow from far away - Paris, who takes down in the end mighty Achilles. STEPHENSON: Yeah. Is profound - because it robs, well, it seems to have robbed soldiers of a kind of satisfaction about facing up to things that they could face. What Western soldiers do not like is the anonymous nature of the warfare that they often have to fight these days. CONAN: Our guest is Michael Stephenson. His new book, "The Last Full Measure: How Soldiers Die in Battle." If you've been in combat, call and tell us what about it we don't understand. 800-989-8255. Email is talk@npr.org. And we'll start with Gene. And Gene's with us from Salt Lake. GENE: Hi there. I was in Vietnam. I was with the 57th Assault Helicopter Company. I've got two air medals. I've been in combat in the air and on the ground. I've been an outpatient at the VA hospital for 20 years. I talk to my person there. But on the street I don't talk to anybody. I don't think anybody who hasn't been shot at could possibly understand. And the person that you're just speaking to used the word anonymous, which is just a great word to describe how insane it is that people are trying to kill you. That you're in a war and you're trying to kill people that you can't hardly even see their face. And people are trying to kill you. And you're remotely located away from them. It's just an insane situation. And I don't think the average person could understand unless they were there. CONAN: Did anything in your training prepare you for it? GENE: Oh, no. No. Not at all. You can train forever, but until somebody is truly trying to take your life, that's when you get the message of just how insane war is and how men perpetuate this and have perpetuated this throughout all of history. We just don't seem to learn our lesson. CONAN: Gene, thanks very much for the phone call. Appreciate it. CONAN: And Michael Stephenson, there's some lessons in there for, well, I think that's accurate through the combat fields that you describe, from prehistory through Vietnam. STEPHENSON: Well, I think what that speaker was talking about was something that's very profound. And that the history of warfare, I mean, you know, to generalize, is about the distance between the combatants. In ancient warfare the distance between the combatants was very close. And as missile warfare - i.e., that is, you know, arrows or guns - became more sophisticated, the distance is lengthened. And then you had something, you know, round about the Second World War where you had something called the empty battlefield, which is essentially what that man was talking about. That is that you are killed by somebody you never, ever see. You are killed a mortar bomb. You are killed by a sniper. In our most recent wars, America's most recent wars in Iraq and Afghanistan, you know, most of the deaths are caused - most of the American deaths, I mean - are caused by either improvised bombs, roadside bombs or by snipers. I mean, these men very rarely, very rarely have personal contact with their enemy. And there's a sense of frustration about that that one can trace back in history. And it psychologically is very, very difficult for these men to deal with. They don't have any satisfaction about coming to grips with something that they can, you know, they can fight, they can see. They see their colleagues killed by - their comrades killed by anonymous weapons. And this is very, very difficult. CONAN: And it cuts the other way, too: drones, air strikes and that sort of thing. But the exception you noted in Iraq was in Fallujah. STEPHENSON: Well, I think there are, you know, in these urban situations - Fallujah's a city. You do have this - oh, God, it must be so terrible to be in that situation where you are fighting street-by-street. And yet there's - you know, the old idea of heroic warfare was based on groups of people facing off against each other. And these are guerilla situations, where you have men creeping about in the allies and sniping and so on. And you basically do the same back to them. And it is robbed of - or rather it doesn't quite the historical, heroic - the context. CONAN: The goal is to shoot somebody in the back. STEPHENSON: Well, you know I mention in my book of - and, yes, and that's fine. You know, in a way, that's what war is about isn't it? I mean, you have to kill somebody. I mean, you have to kill somebody with the least risk to yourself. And that goes way back to prehistoric and ancient warfare, where, in fact, the most effective mode of warfare was the ambush, where you put yourself at least risk and put your enemy at most risk. CONAN: We're talking with Michael Stephenson about the evolution of combat. His latest book, again, "The Last Full Measure: How Soldiers Die in Battle." If you've been in combat, call and tell us what we don't understand: 800-989-8255. Email is talk@npr.org. Stay with us. CONAN: This is TALK OF THE NATION, from NPR News. I'm Neal Conan. Those who understand the experience of combat are fewer and fewer. During the past decade, less than 1 percent of American adults served on active military duty at any given time. A survey last year by the Pew Research Center found a growing gap between civilians and the military, the largest divide since the years between World War I and World War II. We're talking today about the experience of combat. A new book focuses attention on the reality and history of combat, changes in technology, tactics and the consistency of human nature. The book is titled "The Last Full Measure: How Soldiers Die in Combat." Its author Michael Stephenson is our guest. If you've been in combat, what don't we understand? 800-989-8255. Email is talk@npr.org. And we'll go next to Isaiah, Isaiah with us from Anchorage. CONAN: Hi, Isaiah. You're on the air. Go ahead, please. ISAIAH: Well, thank you. Listening to your show, the last caller from Vietnam made me think about some of my experiences in Afghanistan and how it seemed like his experiences in Vietnam were extremely terrifying, you know, with an enemy that was really close to you, who was probably close enough to see shooting at you. And my experience is in Afghanistan, where we were shot at, it seemed like it was always at a much greater distance, enemies shooting at you from another mountaintop, maybe a kilometer away, or at your aircraft as you flew over. Soldiers I was with very rarely, you know, had any way to identify or personify the people shooting at them. That's been one of my main experiences. CONAN: When you fired back, were you firing at individual targets, or putting up some firepower to, you know, to change things? ISAIAH: Well, the first thing, I never fired my weapon in anger. It always seemed like my team was always just right outside of the range, but my platoon being engaged in some firefights. We relied a lot on air support. We almost always called in close air support when we were engaged immediately, even if we weren't sure if we'd need it. So we were always calling in A-10s or, you know, Apaches or some type of helicopter to come in and shoot up a hilltop. We would lay down some suppressive fire with machine guns. But we rarely actually could see our target. There were a couple of occasions where our sniper section could actually see someone, but that was really rare. CONAN: And so you don't know if any of the rounds you loosed off ever hit anybody. ISAIAH: Personally, no. I never personally shot the enemy. I was involved in the area of some firefights. But mostly, I was watching through binoculars and working with our foreign observer to call for fire or call an aircraft. CONAN: And I'm sure it didn't make it any less scary, but how did it change things that you were so far away? ISAIAH: Well, a lot of times, we seemed really detached. You know, fear was kind of a rare feeling for most of us. If you're in a convoy that's getting ambushed, for example, it's, you know, a little more scarier, getting shot at from higher ground. But most of the time, you know, we weren't too afraid. And it seemed a lot more - we seemed a lot more detached than talking to veterans from Vietnam or other wars, where they were in really close combat. CONAN: I wanted to ask Michael Stephenson: Do you see this as a - well, it's obviously a trend, as you pointed out earlier, we're getting further and further - but this impersonalization? STEPHENSON: Yes. But I think what's interesting about the last caller is that - what made me think was that there were two things that have to happen from when - in the situation he was describing. I think that - well, my feeling is that soldiers need to be sustained by some sense of what they're doing and the risks that they're taking is worth it. And sometimes, in these wars, in our most recent wars - I'd say from Vietnam onwards - first of all, there's an ideological problem, I mean, compared to, say, World War II, where big chunks of society don't really support the wars. And therefore the soldiers sometimes feel very isolated. And then there's the nature of the warfare, which is really what that caller was talking about. The nature of the warfare is so disassociated. And how do you create a heroic context for the fighting? And what these soldiers do - my understanding is - is that they create the heroic context within their units. And they, in a way, try and isolate themselves from what maybe the rest of society - or some part of that society that doesn't agree with this war - feels. So they just dig in and they create their own value system. And it might not be one that the rest of us like very much. I mean, urinating on the bodies of dead soldiers maybe would repel most of us. And I'm sure it is repellent. But some - I think that they have rituals and the support, their group cohesion. And that's very important for them - very important for them to be able to carry on doing the work that they have to do, whether we agree with it or not. But it's the work that they are told to do. CONAN: Isaiah, does that make sense to you? ISAIAH: Yeah. I would like to note, though, that in my unit and other people I've served with in the airborne infantry, we were revolted and disgusted by that specific event. I don't think there's any cause, you know - I mean, there's understandable reasons why someone might do something like that to the bodies of, you know, enemy combatants. But as professionals, we look at this as a job, and we really do - especially, you know, when we're thanked by civilians for what we do - it's awkward for us to feel like this is really just a job, this is our work, when people do something as unprofessional and shameful as that. It offends most of us, probably more than most of the civilian populace. CONAN: Thanks very much for the call. Appreciate it. CONAN: Let's go next to - this is Armando, Armando with us from Davenport, Iowa. ARMANDO: Hi. How's it going? I just wanted to add my two cents to the discussion. I was trained as a hospital corpsman, and I was with the frontline unit in Desert Shield-Desert Storm. As with most wars, there's vast amount of times of boredom while we're doing nothing but playing golf and reading books. But when the firefight went down, my training kicked in, and my training - I was just so well-trained in the medical portion, that my focus was very high, and I was doing what I was supposed to do. And for the vast majority of medical people, it's scary, but you're so focused on the person in front of you, well, we get a completely different view of war. It's not till you get downtime that you go, oh, wow. That was really hard. That was really rough. And right in the middle of a firefight, you're so focused, that that's all there is to do, is your job. CONAN: And that, Michael Stephenson, there's so many examples in your book of - these are the moments that people feel most alive. STEPHENSON: Well, it is peculiar, isn't it, that sometimes when one is most at risk, one does feel most alive, I'm sure. Mountain climbers and people like that feel that. But I think also what that last caller was talking about was how - and this happens a lot - that one's fears just drop away, because you have a job to do. And also, he was a medic. And I, you know, I write quite a lot in my book about the extraordinary heroism of medics, particularly in the last - in the wars of the last century and this, who took the most incredible risks and often had no protection at all, except that red cross. And they were absolutely heroic. CONAN: Armando, thanks very much. CONAN: Let's see if we can next to - this is John, and John's with us from Galveston. CONAN: Hi. You're on the air, John. Go ahead, please. JOHN: Oh, go ahead. No, absolutely correct. You were talking about the evolution of, I guess, warfare, in the sense that the ancient warriors, it was awesome and you were proud. You had a sword. You went on a battlefield. You had a sense of control. You control this. If you lose, you lose. There's no dishonor in it. Get into a convoy now in today's combat, there's no control. Don't know what's going to happen. You don't know when it's going to happen. You do know something's going to happen. And that's a very scary thing. CONAN: I could understand that feeling of lack of control. But Michael Stephenson, again, reading your book, that sense that there was control on the ancient battlefield, that may be a myth. STEPHENSON: I think it is, a bit. I mean, I think I understand completely what that last caller was talking about in terms of, you know, being sort of passively a victim in modern warfare. But I think it's a slight romanticization about ancient warfare, medieval warfare, that somehow there was a kind of satisfying confrontation, and it was, you know, you lose or you win. I think for a lot of warfare, it is an absolutely bloody scrum. And the romantic part of it, the heroic part of it, you know, gets - I don't know, it gets lost there in the modern blood(ph) . CONAN: There's a - and John, thanks very much for the call. There's a gravesite you describe in the book after a medieval battlefield, a place called Visby, where forensic experts were able to go in and actually examine the kinds of wounds that these men died from. STEPHENSON: Yes. And most of those men - well, the situation was that it was a sort of a lower class group of men who were sort of shoved out in front of this town, Visby, to protect them against a much more organized army. And they were killed horribly, really. I mean, they were cut down, and a lot of them were killed with multiple blows and often blows to the back of the head and so on. So, you know, the - we have to be careful about this whole heroic notion, and I think that some - obviously there is heroism in warfare, but we should be just a bit nuanced about it and look at it with as much detail as we can. CONAN: There's also an aspect of combat in which the most dangerous and deadly period is when one organized group suddenly breaks and flees and you have what military experts like to call pursuit, and you note that this is moments when huge numbers can be killed. STEPHENSON: Yeah. Pursuit is a nice euphemism, I think, because it suggests that people get away, but I don't know what it is about the human psyche. I mean, I think that there is that - I think actually what it is is a great unleashing of tension. You're in battle. It's the most appallingly intense experience. You could be killed. And then suddenly you're not going to be killed, and in fact you are winning here. And you would imagine that there might be some compassion towards the defeated, and often there is. I mean, it's not - this is not a universal thing, but very often there isn't. And the fleeing one sort of inflames that homicidal instinct. And there are many, many examples that - of this, and it's just part of human nature, I suppose. CONAN: ...to prehistoric times. Trophies and despoiling. Everybody remembers Hector's body being dragged three times around Troy. STEPHENSON: Yes, it does. I don't know - yes, and there are all kinds of, you know - I mean, scalping, obviously. And - but scalping, which we always associate with indigenous warriors, was actually rather enthusiastically taken up by Europeans in America in the, you know, in the early part of the settlements and in the 19th century. And you know, there are many accounts of taking ears and other body parts in Vietnam and so on. CONAN: We're talking with Michael Stephenson about his new book, "The Last Full Measure: How Soldiers Die In Battle." You're listening to TALK OF THE NATION from NPR News. Mark is on the line with us from Orlando. MARK: Hi. Yeah. I was - I'm a veteran from the action in Afghanistan. I think it's a crucial point that in the heat of battle, the individual soldier, they fight for each other. You fight for your brothers, your fellow in arms right there. At that point, ideologically, the cause no longer counts. What you do is you fight for each other. CONAN: I think that was one of the essential points of John Keegan's wonderful book, "The Mask of Battle." MARK: Absolutely. You forget - you forget fear. You forget the ideological causes why you're there, and you only worry for your brothers in arms at that point. STEPHENSON: I know, .talking with my own father about World War II, and he went off for six years to fight. And I kept saying to him, why did you do that? I mean, what was the ideological - you know, what - and he didn't want to know about that. It was just - I was with my blokes, my guys in my unit, and we fought. And we did it to support each other, and I think that's been the essential truth of warfare through the centuries. MARK: Absolutely. Absolutely. And the soldier, when given a cause that matters, he will do almost anything. We had a situation where we were going to rescue a captured American soldier, and it was into the jaws of absolute combat. We knew we were going into it. I had not a single question from my soldiers. They gladly walked into that because it was for one of their own. CONAN: It work out OK, Mark? MARK: We never got him back. CONAN: I'm sorry. Thanks very much for the call. CONAN: Let's see. We can get one more caller in. This is Dave, Dave with us from Lansing. DAVE: ...for discussing this topic. I experienced combat in Baghdad in 2007. And I think one of the things that needs to be pointed out about these modern conflicts that we're engaged in now is every soldier reaches a certain point on the battlefield where they accept their own fate. They understand their fatality, for lack of a better word. And in Iraq, I know, for me, it was very disconcerting in that we would roll out on patrols on a daily basis, and you struggle with that fear, and you overcome that fear. And then you would retreat back to the relative safety of a FOB, or a forward operating base, at night, call the wife, have a Green Beans coffee, watch a movie. And then as soon as it's time to bunk down, you're planning that next mission, and the fear that I would feel just laying in my bed, waiting to roll again, I think, was worse than any fear I ever felt in actual combat. STEPHENSON: Hmm. I wonder if I could ask you a question which has interested me. I mean I read lots of accounts of men who say that as they went into combat repeatedly, their fear dissipated, and other men who said the more they went into combat, the more they knew about what that might - what might happen to them, their fear increased. Did you find that? DAVE: I would have to say that the latter was my case, especially - you know, the first time I went to combat, like any soldier, I was untested. I was, you know, I hate to say it, there were certain feelings of impending glory. You know, my father was a World War II veteran. And it didn't take very long for me to realize that once you've had that baptism by fire, there's - then the long slogging(ph) fight begins. You know, it's not exciting anymore. It can be terrifying and mind-numbing. CONAN: Dave, thanks very much for the call. Appreciate it. DAVE: All right. Thank you. CONAN: And Michael Stephenson, thanks very much for your time today. CONAN: The book is "The Last Full Measure: How Soldiers Die In Battle." It's the TALK OF THE NATION from NPR News. Transcript provided by NPR, Copyright NPR.